To this day, no court, regional or international was created to address the massacre, no security personnel, regardless of his rank, was held accountable, and none of the victims were remedied. The 17,000 enforced-disappearance cases resulted in a severe social disintegration which led to an overwhelming grief the effects of which haven’t gone away yet. Unfortunately, the main suspect in this massacre, Rifaat Al-Assad, is still moving freely across Europe and investing millions of dollars which he stole from the Syrian people. 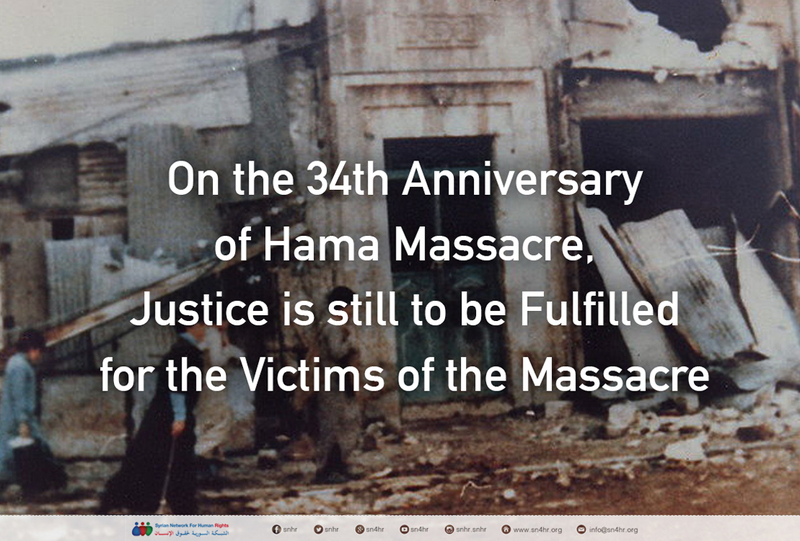 We fear that the scenario of Hama massacre, 1982, will reoccur and impunity will protect the criminals from punishment again in light of the Syrian constitution that grants impunity to every member of the security and military forces and the blatant absence of any discourse that supports the formation of a special court amid the Russian and Chinese support, which are promoting the culture of impunity. The international community’s explicit silence regarding the criminals responsible for Hama massacre, 1982, and their rehabilitation, especially Hafez Al-Assad and Refaat Al-Assad, has incited Bashar Al-Assad, Hafez Al-Assad’s son, to perpetrate hundreds of massacres against the Syrian people after the beginning of the peaceful protests in March 2011. This silence is still manifesting as no serious steps were taken to deter these acts which are the main reasons behind the spread of extremism. Also, these acts evoked the oppressed people to join extremist factions and resulted in tearing the Syrian state apart.